This summer I will be participating in three group exhibitions with the Montreal based gallery, Stella Ripley Contemporary. Below is a lineup of the three exhbitions, where I will be showing three of my textile works, and one new embroidery work. Specific dates will be posted soon! I am thrilled to announce my upcoming solo show at Heidi Vaughan Fine Art in Houston, Texas this October 2019. This exhibition will showcase an entirely new body of fiber paintings that I have spent the past year working on. The opening will be on Saturday, October 19, 2019, with a VIP preview on Thursday, October 17. Please email heidi@heidivaughanfineart.com if you would like to be included in the VIP preview list. Check back later in the summer for dates on the artist talk I will be giving in the gallery. Studios will be open from 1-5pm on Saturday March 23, and are located at 6700 Harrisburg Blvd in Houston. I am pleased to announce my participation in the Texas Art 2019 group exhibition, curated by Jennie Goldstein, Assistant Curator at the Whitney Museum of American Art in New York. 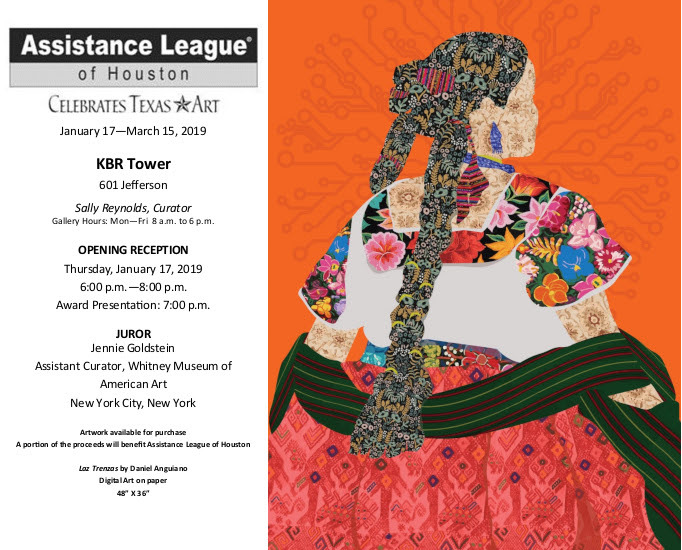 The show opens January 17 at the KBR Tower in Houston, and will remain up until March 15, 2019. I have a select few fiber paintings available at Vaughan Mason Fine Art Gallery on the Lake Street Gallery strip in Houston. They will be available and showing at the gallery’s Holiday Art Party this weekend, Saturday December 8 from 11-6pm. Friends! I am thrilled to share that I will have two of my Pinglet paintings displayed at Aqua Art Fair in conjunction with Art Basel Miami Beach this December 5-9, 2018. These works will be displayed at Booth 227 with Brooklyn based arts company SHIM. The company has partnered with organizations and universities such as VCU Arts, Concordia University, Syracuse University, Studio 200, Blick Art Materials and Adios Art Residency and I am thrilled to be working with them once again. In 2016, I exhibited with SHIM at Arthelix Gallery in Brooklyn, and will be joining the SHIM alumni group of artists for this opportunity at Aqua Art Fair. If you are in the area for Art Basel, please swing by Booth 227 at Aqua to see the works in person. I was recently interviewed and photographed by Denver Life Magazine. Check out the beautifully written article on my Fiber Painting process in their October Issue!